Jamaican businesses are mobilising to make significant gains by partnering to develop trade and investment opportunities leading up to the Olympic Games in London, UK in 2012. 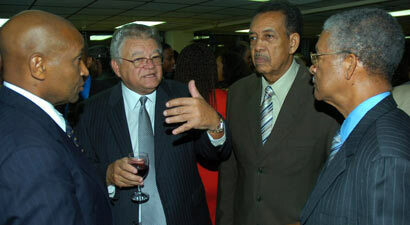 Llewelyn Bailey (right), Jamaica National Building Society Assistant General Manager, pays keen attention as Karl Samuda (second left), Minister of Industry, Investment and Commerce talks business with Ludlow Watts (left), general manager of the Sports Development Foundation; along with Howard Aris, president of the Jamaica Amateur Athletic Association. Earl Jarrett, Chairman of the Trade Policy committee in the Private Sector Organisation of Jamaica (PSOJ) and general manager of Jamaica National Building Society (JNBS), said that government and private sector companies are being invited to come together to showcase the country’s products and services in the Meet Jamaica @ London 2012 programme, to be promoted from 2011 to the Olympic Games in London, in 2012. He pointed out that JAMPRO and the PSOJ have joined forces to activate the sector. “Jamaican entrepreneurs will have the unique opportunity to promote Brand Jamaica during the next 18 months,” Jarrett stated. He was speaking at the launch of the programme, at the Courtleigh Auditorium in Kingston (on Wednesday, October 13), before an audience of government ministers, the British high commissioner, private sector leaders and representatives of other interest groups. “This is our chance to highlight Jamaican music, cuisine, coffee, beer, rums, fashions and manufactured goods, our world class tourism product, as well as highlighting prospects for doing business in the country. The promotion will include a series of expositions and trade missions in London, which has one of the largest concentrations of members of the Jamaican Diaspora in the world, as well as, in Birmingham, which will host the training camp for the Jamaican Olympic team. The Jamaica Amateur Athletic Association (JAAA) has already signed a contract with the Birmingham City Council for the team to be located at the University of Birmingham, prior to the Olympics in London. Activities will include a Jamaica theme park in Birmingham, promotions at local and international athletic events such as the IAAF World Athletics Championship in Daegu, South Korea in 2011, and forging closer relationships between institutions such as the University of Birmingham and tertiary institutions in Jamaica. Companies with strategic interests in the UK and European markets have committed to work with JAMPRO, the PSOJ, the Jamaica Tourist Board, the Ministry of Foreign Affairs and Foreign Trade, and the Jamaica Amateur Athletics Association, to achieve the objectives of the London 2012 initiative. The key PSOJ stakeholders include Grace Kennedy, LIME (Cable and Wireless), Red Stripe, Jamaica National Building Society, Jablum, Digicel, J. Wray & Nephew, National Continental Baking Company and Jamaica Producers Limited. Karl Samuda, Minister of Industry, Investment and Commerce with responsibility for JAMPRO in his address, affirmed the commitment of his ministry to work with the Ministry of Foreign Affairs and Foreign Trade as well as the Ministry of Tourism to support the business community in the programme.